Does this mean we were not salvages before the Spanish came? Funny. My Swiss husband said that in school they learned that Magellan was killed by savages. Correction then. Make that savages who can read and write! The Spanish even noted when they "discovered" the Philippines that "there is scarcely anybody who cannot read or write in letters proper to the island Manila." (Pedro Chirino in 1602; source: A page for Philippine Prehistory). This script is called baybayin. Unfortunately, no baybayin documents have survived from before the spanish era (Paul Morrow). Through the years, a lot of fakes have surfaced and have been proven as hoaxes. Hopefully, a few artifacts are standing scrutiny and are now starting to give us a glimpse of the thoughts of prehispanic Filipinos. Three of these artifacts that showcase early Filipino writings are: 1) The Laguna Copperplate; 2) The Calatagan Pot; and 3) The Butuan Silver Strip. What is exciting is two of these three artifacts have recently been deciphered. Found in 1989 in the mouth of the Lumbang river, a subsidiary of the Laguna de Bay, the Laguna copperplate is very exciting because the text mentions dates, names of people and towns that still exist today. This crushes arguments that the artifacts with writings are rare because they were just brought to the Philippines during trade. Obviously, the Laguna Copperplate was made by the inhabitants of old Philippines. It was determined that the date written in the text corresponds to Monday, April 21, 900 C.E.. The translation of the text was facilitated because the writing is related to an ancient Indonesian script called kavi. The text itself is a mixture of Sanskrit, Old Malay and Old Tagalog hinting to Hindu influences even before the muslims arrived. Obviously, there is a lot of the Philippines prehispanic history that is not known. The Laguna Copperplate was translated in 1990 by Antoon Postma, a Dutch expert in ancient Philippine scripts and Mangyan writing, and Dr. Johann de Casparis, an expert in ancient Indonesian scripts. Long Live! Year of Siyaka 822, month of Waisaka, according to astronomy. The fourth day of the waning moon, Monday. On this occasion, Lady Angkatan, and her brother whose name is Buka, the children of the Honourable Namwaran, were awarded a document of complete pardon from the Commander in Chief of Tundun, represented by the Lord Minister of Pailah, Jayadewa. By this order, through the scribe, the Honourable Namwaran has been forgiven of all and is released from his debts and arrears of 1 katî and 8 suwarna before the Honourable Lord Minister of Puliran, Ka Sumuran by the authority of the Lord Minister of Pailah. Because of his faithful service as a subject of the Chief, the Honourable and widely renowned Lord Minister of Binwangan recognized all the living relatives of Namwaran who were claimed by the Chief of Dewata, represented by the Chief of Medang. Yes, therefore the living descendants of the Honourable Namwaran are forgiven, indeed, of any and all debts of the Honourable Namwaran to the Chief of Dewata. 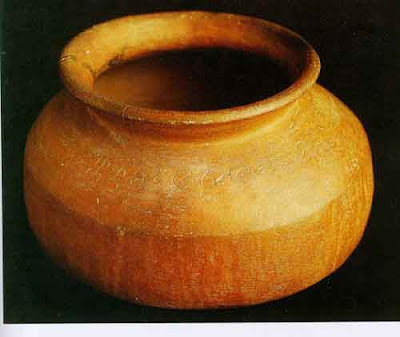 The Calatagan pot is the first pre-hispanic artifact with writing to be found (Hector Santos, A Philippine Leaf). The authenticity of the pot has been questioned ever since it was found in the 1960s in Calatagan, Batangas. Noone had been able to decipher it for a long time, all they know is that it shows a similarity to older scripts used in Indonesia, suggesting that Philippine scripts may have evolved earlier than what was originally thought. Recently, the pot has been deciphered by Dr. Ramon Guillermo of UP Diliman. This success is a significant step in understanding the Philippines vague prehispanic history. Click here if you want to read the paper of Dr. Ramon Guillermo and here if you want to read more about the Calatagan pot. Found in Butuan in the mid seventies inside a wooden coffin by treasure hunters. 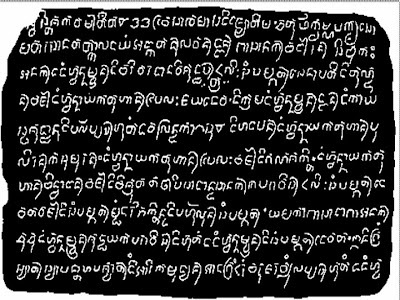 The script is also similar to the ancient Indonesian script, Kavi. 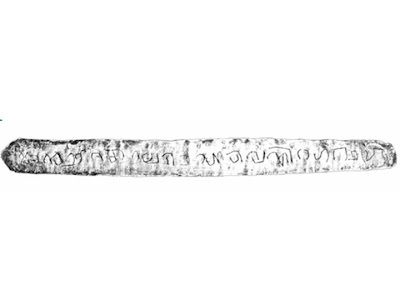 Unlike the first two artifacts mentioned, the Butuan Silver Strip have not yet been deciphered. But isn't it exciting to think that there were many different kinds of scripts used before the spanish arrived suggestive of a rich prehispanic culture? Click here if you want to read more about the Butuan Silver Strip. Many flight deals offer really cheap flights and this is considered a vacation fringe benefits part. This includes las vegas flights as well as new york flights. That's great news! More window into the past! I can't believe they still teach the same thing today. Making themselves the "saviours" who taught us how to be "civilized", "read", "write", etc. Here in the Philippines we are being taught that the Filipinos and Chinese were trade partners already even before the first Western colonial ships landed on our shores. Btw, I think you made a typo "salvages" instead of "savages", unless that's how bad Europeans looked at our ancestors. I don't know if they still teach these things today but for sure during my husband's younger years. I think our government should spend more money learning about the past because obviously there are so many things we don't know. Yes, I agree, our government needs to start archaeological projects, I'm sure there are many Filipinos who will benefit from these projects (talk about new jobs at home). Sometimes we need to know the past so we can reach our future. The past will give us an understanding of who we really are, where we came from, and understand our identity and way of thinking. Then and only then we can face the future, as we say it in Filipino, "taas noo kahit kanino". I cannot agree with you more. Now, all we have is a version of our history written by westerners glorifying the west with the sole purpose of inflating their egos. It's about time that we find out who we really were. Prove that they're not savages. Obviously the fact that my ancestors knew how to read and write proves that they are not savages. I think anyway, the savage in our story are the people who came and killed our culture. If you think that the ancient philipinos are savage than that obviously indicates that you know nothing of the history of the prehispanic history of the philipines, but for whatever reason without any proof, you assume they're savages. Before the spanish came, the ancient philipinos already had many attributes of a civilisation. They already had a written language, they had a highly advanced system of government and they had laws, they knew how to make metal weaponry and gold jewelry, they traded with many other civilisations of southeast asia, even china. They made prosperous city states, (Maynilad, Cebu etc.) they clothed themselves very well. And also they had advanced social organsiation. Also they were excellent seafarers that would even compare with the ancient Phoenecians. To bad they didn't build any lasting structures to prove their existence. But then, sooner or later, we would be colonizing our own.